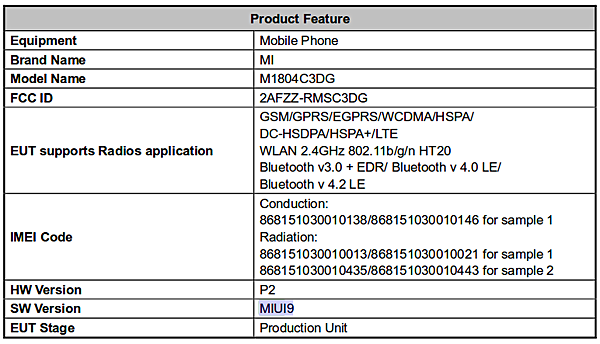 A couple of new Xiaomi devices have been certified by the Federal Communications Commission (FCC) in the US. The FCC ids are 2AFZZ-RMSC3DG and 2AFZZ-RMSC3CG, while model numbers are M1804C3DG and M1804C3CG. The listings further reveal that both devices run MIUI 9. Sadly, nothing else is known about these devices currently, including what specs and price tag they'll carry and when they'll be available. The Mi Max 3 is set to be made official next month, so it's possible these devices will also be unveiled then, but there's no confirmation at the moment. this phone is redmi 6a i had 1 of it now. 2 to 4 a week.